Peaceful Reader: Scholastic Book Fair's in town. And I made muffins for the teacher all-day preview. It's my way of luring the teacher's in to the fair to make a wish list so parent's will buy books for their classroom. I wanted them to be yummy and enticing (and unfortunately my idea of yummy is healthy than what the rest of the world is interested in) so I scrolled through a few cookbooks to find something that spoke to me. I found it in my King Arthur Flour cookbook; Chocolate Breakfast Muffins. I made a double batch. Groovy Girl thought they were delicious. In a large mixing bowl, whisk together the cocoa, flour, sugar, baking powder, baking soda, salt ,and chocolate chips. Set aside. In a large measuring cup or medium-sized bowl, whisk together the eggs, milk, vanilla, and vinegar. Add the wet ingredients to the dry, along with the melted butter, to the dry ingredients, stirring to blend. There's no need to beat these muffins; just make sure everything is well combined. Scoop the batter into 12 lightly greased muffin cups. 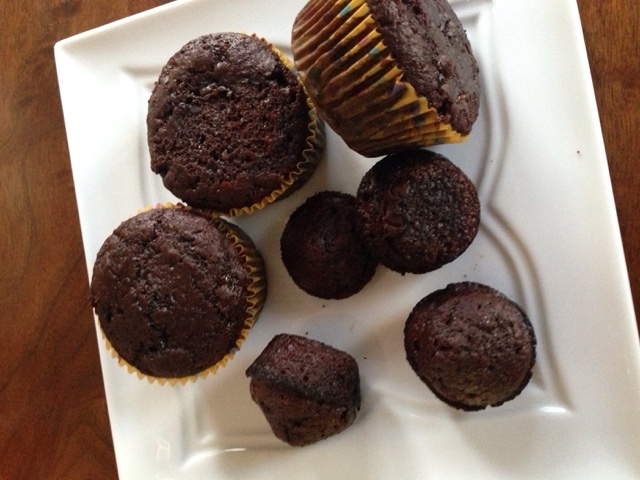 Bake for 15-20 minutes, or until a cake tester inserted in the center of a muffin comes out clean. Don't let them burn-they do cook quickly and my oven cooks high. Remove them from the oven, and after 5 minutes remove them from the pan, allowing them to cool on a wire rack before serving. I love baked goods warm. I ate a few of the mini muffins just after they'd cool a bit and they were delicious. The chocolate chunks (which is all I had) and the toffee bits (I added for fun) were perfectly melty. When I served them on Monday I heated them up also so the first few smart teachers had warmed up muffins-melt-in-your-mouth chocolate breakfast muffins. Check out King Arthur's amazing website.